Jessie Lumb and Shirley Nilson Hall in “4,000 Miles” by Amy Herzog. Photo Credit: Novato Theatre Company. 4,000 miles, that’s a long way to go, for tragedy — that’s how far young Leo Joseph-Connell (Jesse Lumb) has travelled on his bicycle, from the Pacific Ocean to the Atlantic, after facing a terrible upheaval. Now, in New York, he comes up against a force he cannot easily resist — his shrewd 91 year old grandmother, Vera Joseph (Shirley Nilson Hall). In the 2012 Obie Award-winning Best New Play, “4,000 Miles,” Amy Herzog gives us an emotional study of the 21 year old aimless adventurer and his Marxist grandmother. When Leo knocks on Vera’s door in Greenwich Village at 3:00 A.M., he is unexpected and unannounced. That’s his calling card — avoidance, silence, and a splash of arrogance. He seems more like a teenager, a college drop-out. He doesn’t talk much to his mother back home in Minnesota because he’s had enough of her looking over his shoulder. As played by the talented Jesse Lumb, Leo is also courageous, concerned, and calm. That’s the contradictory part of Leo’s coltish behavior: he wants to help people and reach out to them, but he does not readily understand or offer a hand at the right moment. It takes a lot of negotiating and nesting with Vera for cross-country Leo to figure out who and what he’s dealing with in his cantankerous grandma. Vera packs a lot of truth into her confrontations with the young lion. Hall makes a convincing crotchety Communist and her truth takes the measure of his wildness. Lumb, spot-on as the arrogant novice who has suffered beyond his years, becomes warm-hearted and vulnerable, especially in his encounters with his sharp-minded ex-girlfriend Bec (Emily Radosevich) and his potential one-night stand Amanda (Courtney Yuen). Radosevich is flinty and convincing as a girl learning to deal with a self-centered guy like Leo. Yuen is amusing and witty in her mercurial testing of Leo as a potential hot fling. Vera is frugal; Leo is self-indulgent. She is careful, he is adventurous. She is coherent, he is aimless. And yet the engaging Jesse Lumb leads us on a journey of understanding and some self-acceptance as a New Age Wandering Jew. Because Lumb’s Leo seeks an undefinable “truth,” whom should he approach but Vera? Her name means Faith and Truth, after all. Vera’s truth may yet save him from disgrace. He is on a perilous quest, and he does not even know it. She is his Delphic Oracle and she may even know that. Herzog’s play, on the psychological and individual level, and on the social/political level, is about breaking free and being responsible for others — beyond yourself. Vera has the words for this: her presence and her generosity link Jesse’s hopes for himself to her urge toward justice and a humane worldview. Neither character is a saint. Nor is the fun-time girl, Amanda, who Jesse brings home one night. Their amusing attempt at seduction makes a refreshing comedy, as unexpected tragic events unfold. Death and dismay haunt Leo and Vera—but they are still negotiating. This is a play that will last a long time —a four-handed classic, based on youth and age, with generations struggling to understand, to profit, to impress. Lumb and Nilson make these two opposed characters fascinating to watch, as they negotiate New York door locks, money, sleeping, pot, and TV, together. In the lovely scene where the two watch TV, together, late at night and stoned, you can feel them drawing knowledge one from the other. 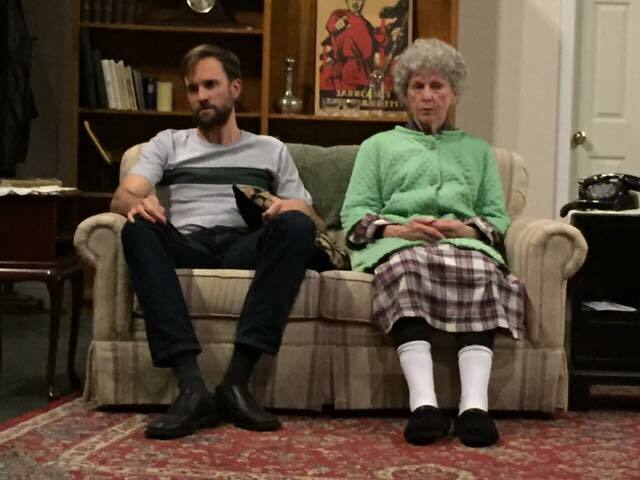 “4,000 Miles” by Amy Herzog runs through April 17, 2016 at the Novato Theatre Company. For further information, click here. “4,000 Miles” by Amy Herzog, produced by Novato Theatre Company. Director: Norman A. Hall. Production Manager: Kim Bromley. Stage Manager: Madge Grahn. Set Design: David Shirk. Costume Design: Marie Meier. Wig Design: Chez Simonds. Lighting Design: Frank Sarubbi. Sound Design: Bruce Vieira. Cast: Vera: Shirley Nilsen Hall. Leo: Jesse Lumb. Bec: Emily Radosevich. Amanda: Courtney Yuen. Posted in Reviews.Tagged 4000 Miles, Amy Herzog, Barry David Horwitz, Charles Kruger, Novato Theatre Company, san francisco bay area theatre reviews, theatrestorm.